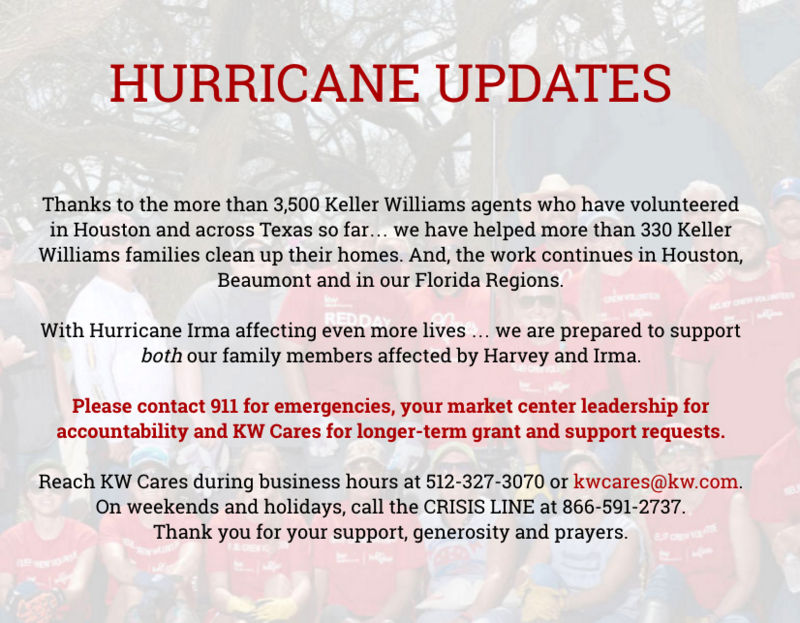 Update 9/12/17: Our KW Cares Disaster Response Team is currently en route to Florida with supplies, volunteer work crews and support available as soon as our KW Command Center can be established. Once a Command Center location is secured, updates will provided on www.redrelief.org. 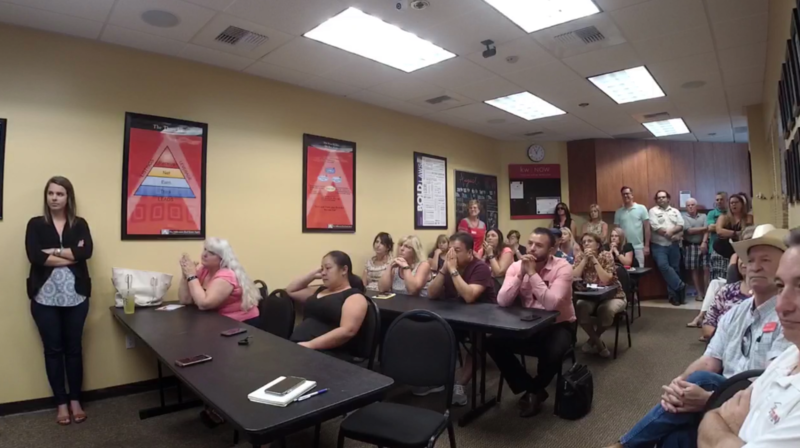 This week our market center called together a special meeting for an announcement that left all of our agents questioning what was going on for an entire day. After numerous calls and texts curiously asking what was happening we finally met in our training room on Wednesday around 11:00 am. Eagerly wanting to know what was going on our Owner/Operating Principal, Robert Harris started off the meeting asking everyone “How’s everyone’s day going?” then proceeded to play a video on the big screen for everyone to watch. This video showed numerous clips put together of news reports and aerial views of the aftermath from the recent Hurricane Harvey in Houston, Texas. The video went on to show people being rescued by Coast Guard helicopters, cars completely submerged underwater, and furniture just floating in people’s living rooms. It concluded with showing pictures of KW Cares’ 18-wheeler semi trucks ready to head to Houston with supplies to provide help to those in need. 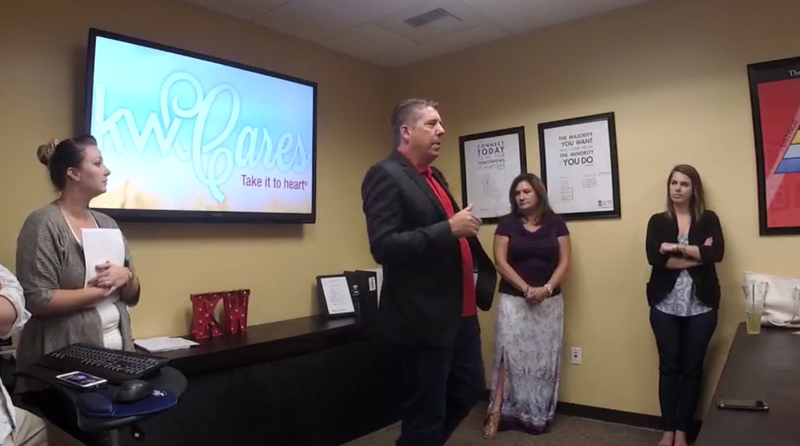 The video and music continues to fade out and Harris asks “How’s everybody doing now?” The video brought tears to agents eyes and made them realize how much this hurricane had impacted the lives of people in Houston. The meeting further went on to let everyone know what the “Special Announcement” was. 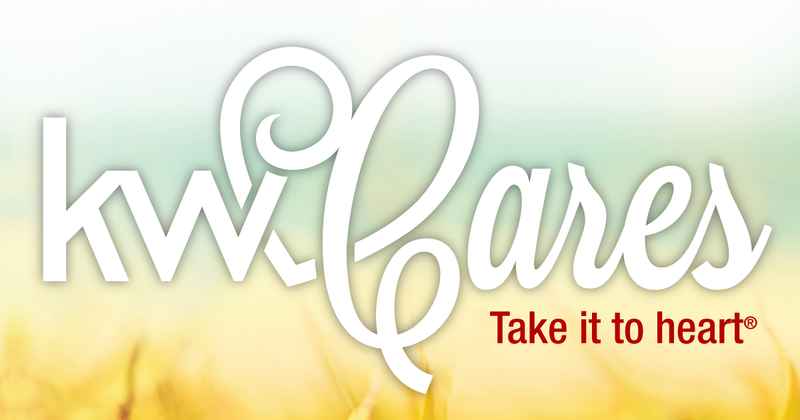 Our Market Center, at the urging of Owner Robert Harris, unanimously decided to take the $8,000 we had in our budget for the holiday party along with an attitional $2,000 donated personally by Robert, and donate it to the KW Cares Harvey Relief Fund. We felt the $10,000 would be better spent helping those affected by the recent disaster rather than on a party. After the “Special Announcement” we passed out forms to all the agents so that they could donate as well which ended up in raising another $7,480. In total our Market Center has raised $18,770 so far. As donations keep coming in the number is expected to grow. We hope that our decision as a market center to donate our Holiday Party budget to this crisis will inspire other market centers to do the same. Our thoughts and prayers go out to those all affected by Hurricane Harvey.